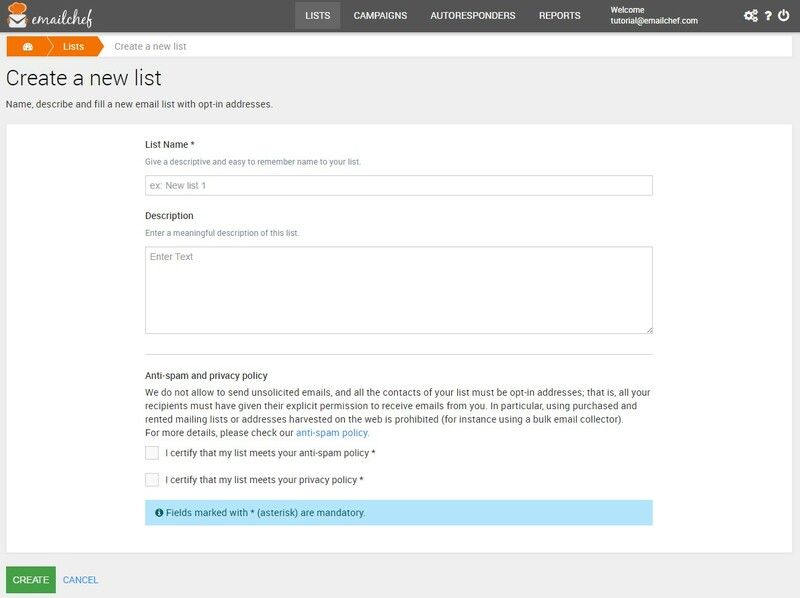 To create a new list with eMailChef, click on the “Add contact” block on the homepage, or on the second button in the menu above, “Lists”. You will be redirected to the list management page: click on “Create a new list”. Here you can give your list a name and a description. We suggest to use highly descriptive names to help you identify quicker the list you want to use. Then you need to flag the two boxes below to certify that your list is complying with our antispam and privacy policies. Which means that you’re going to add only contacts that have given their explicit permission to receive emails from you: for instance collected via a web sign-up form. We absolutely do not allow to use rented or bought mailing lists.